On 18 September, Ahmed Gabr, a diving instructor and retired army officer, will attempt to be the first man to dive more than 318 metres. With the help of a team from the H2O Divers scuba diving center in South Sinai's Dahab, Gabr will embark on the attempt to reach the depth of 350 metres off the coast of Dahab, a feat which will take him an estimated 14 and a half hours under water. According to a press release by the world record attempt website, Gabr’s attempt was accepted by the Guinness Book of World Records, who will be present on the day of the dive to arbitrate the undertaking. 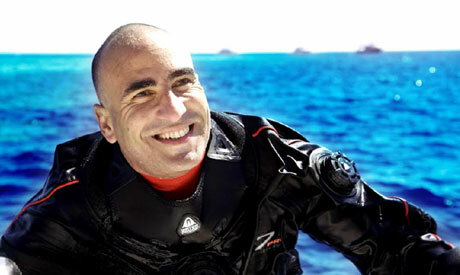 The current official record holder for deepest saltwater scuba dive is South African diver Nuno Gomez, who dove to a depth of 318.25 metres in 2005, also off Dahab’s coast, which took him over 12 hours according to Guinness. The descent is quick, taking just minutes but the ascent must be slow to allow for enough decompression time, which in scuba diving means allowing enough time for gases potentially harmful to the diver to depressurize and leave the body. Gabr and the diving team underwent rigorous training for the attempt which included several training dives, some of which simulated underwater emergencies. The team includes over 30 members, including a surface support crew, support divers to help Gabr, a logistics team to make sure all runs smoothly and others. The feat should consume at least 124 cylinders of air and other gas mixes typically used in deep diving. Dan Goodman, the event manager of the attempt, told Ahram Online that new equipment acquired for the attempt cost a hefty LE94,000 (€10,000). "The cost is exponential, the whole team is working on a volunteer basis," Goodman said, adding the huge cost makes it impossible to pay anyone for their work. “But everyone is excited and putting in extra hours,” he assures. Helium, a gas essential in some of the diving mixtures, costs LE18,800 (€2,000) per training dive. The high cost forced H2O to set up an account for donations. Gabr is to enter the water at approximately 8am on Thursday 18 September off a boat on the southern coast of Dahab. He plans to secure a tag at 350 metres, or one of a few shallower ones past 318 metres, which – if he is successful in returning – would prove he broke the world record.